A lot of Brightonians will know Koba as a small private members cocktail bar oddly above Oddbins and next to Waitrose on Western Road. I used to go there yonks ago and it was voted one of the UK's top bars by The Independent. 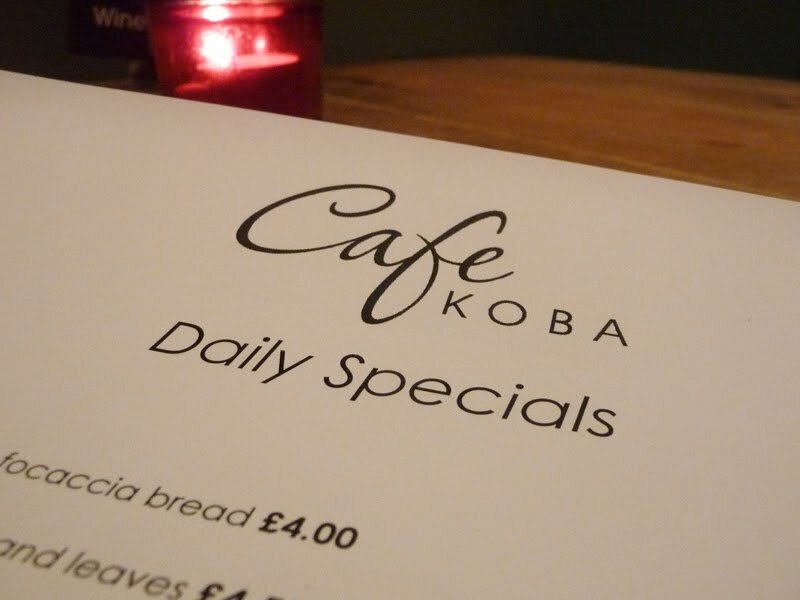 Now, having purchased the Oddbins space below, Koba has transformed and expanded into Cafe Koba with a bar area at the front, two dining/drinking areas, two private hire rooms above and an outside terrace. It's proving a hit with the Hove yummy mummies in the day as somewhere to offload their Waitrose shopping and pampered children to have a cup (or glass) of something, with the lights dimming in the evening for dining and drinking. Although you can still order the food served in the day, there is a separate evening menu. 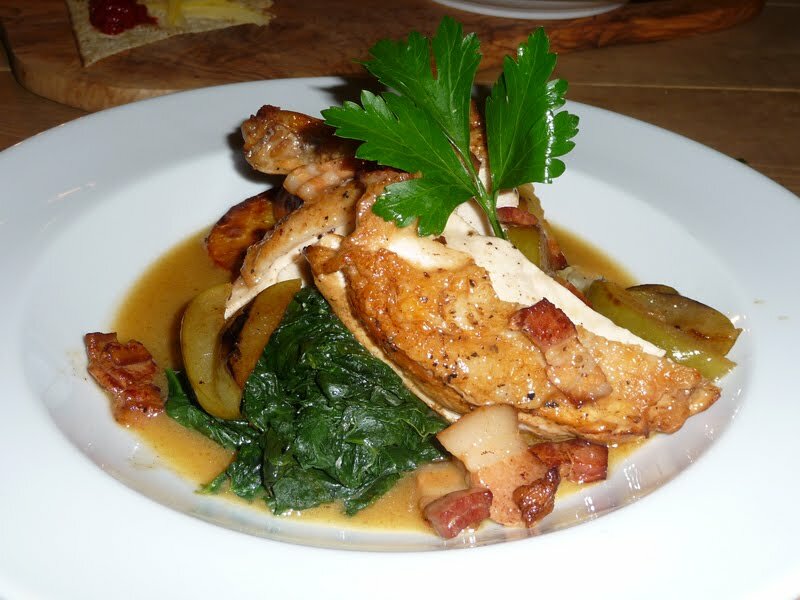 On it you'll find a good mix of robust food with some really bolshy flavours and huggy hearty dishes; Gnocchi with Cavolo Nero, "Woolly" Lamb burger, Beef, Prune and Guinness Stew and a slow roasted "Happy" Pig Belly with Flagelot Beans. I chose the Parsnip Fritters with Piquillo Aioli and Leaves (£4.50) to start which arrived prettily presented on a nice olive wood board. 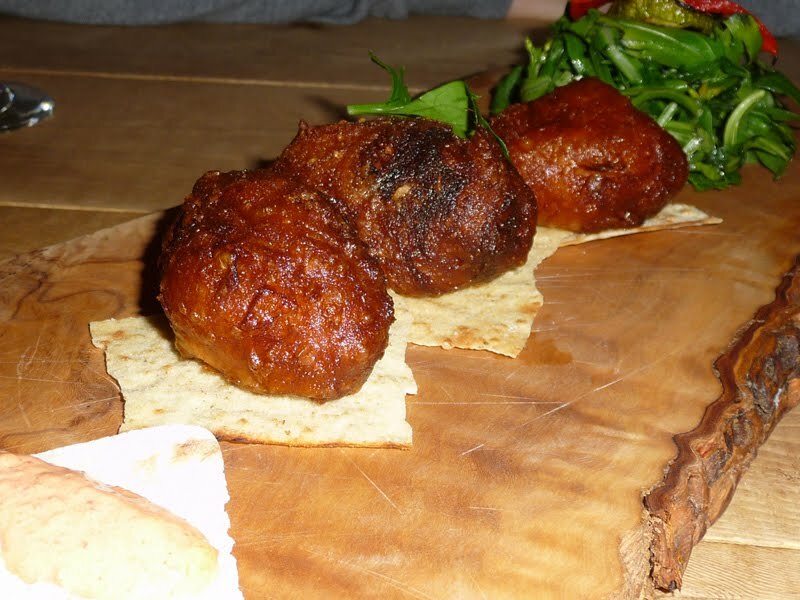 The fritters, despite looking the part, were very soft and rather greasy. The mushy texture was helped a little by the crisp bread but overall the delicate, sweet flavour of the parsnip was lost. 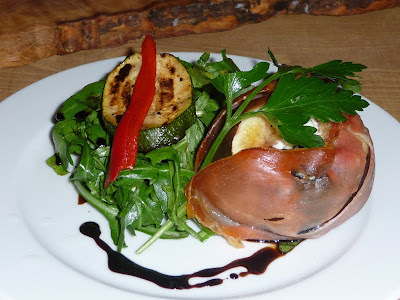 Mr GF's starter was the Figs wrapped in Serrano Ham stuffed with Goats Cheese (£4.95) which was pleasant however cooking Serrano or Parma ham can sometimes give it an odd, pungent taste which in this case, transferred to the fig. Still the idea of the crisp ham with the soft fig and gooey melted cheese inside worked well, Mr GF enjoyed it and that's what matters. Better by a long shot were the mains. My Pot Roast Rooster with Cider, Apple and Dry Cure Bacon (£11) was absolutely fantastic, the buttery chicken so flavoursone and tender. In fact, I would go so far as to say that this was the best chicken dish I've had out for quite some time. The accompanying Boulangere potatoes were divine, crisp and chewy and soaking up all of that beautiful, tart cider sauce. However, a crying shame was the spinach which was grittier than an Irvine Welsh novel. I had actually found a tiny snail in my starter's salad which I wasn't going to mention here as these little mistakes happen, but gritty spinach is plain lazy washing and easily avoided. As the rest of the dish was so good, it got pushed aside and ignored. Tsk tsk. 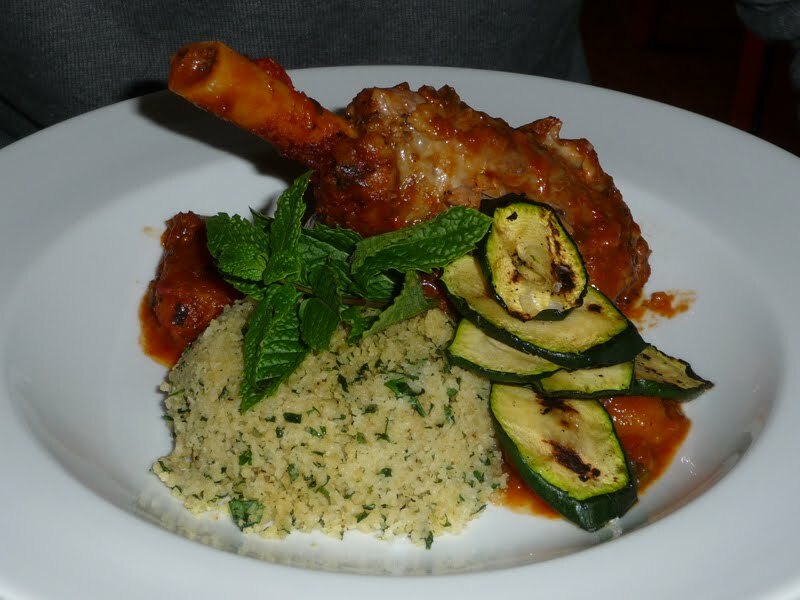 Never one to resist a lamb shank on the menu, Mr GF went for the Braised Moroccan Baba Lamb Shank with an Apricot and Tomato Sauce (£12) which was well cooked and tender. The sweet, acidic kicked sauce was lovely and greed would have demanded more of it. Slivers of preserved lemon slices and a dollop of harissa were served separately for those wanting to zing this dish up to their own tastes which I thought was a nice touch. 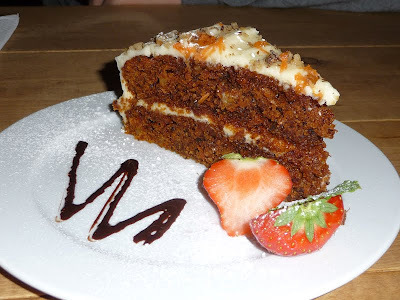 Desserts were limited but the displayed cakes at the entrance looked great and the Carrot Cake we shared was a gorgeous example. As the space is mixed with diners and drinkers (and predominantly drinkers on our visit) it did feel a little awkward and uncomfortable dining, not being helped by a particularly rowdy group of swearing men next to us. Mixed drinking and eating spaces rarely work and this is a prime example of why it's not a good idea. Also, the music with its heavy bass is ideal for a bar environment but not so good for an evening meal. I'm really not sure how to sum up Koba Cafe. It has ba(r) and cafe in the name. And from what I can gather, it's a former cocktail bar which is a cafe in the day, a deli in the summer and in the evening, a bar, restaurant (serving modern gastropub food) and sometimes live music venue with additional private room hire for parties. They seemingly have a lot of fingers in a lot of pies but it maybe worth their while concentrating on just the one pie for a while to establish some sort of identity. As it stands it isn't quite working and on talking to a few people about it, are currently just confusing potential customers. It must be said that the staff are lovely and the food, with a few small nips and tucks, has the potential to be excellent. If it was me I'd run with this as a start, opening as a cafe in the day and in the evening keeping the two larger areas for dining and the smaller, stylish area at the front for sipping their good cocktails and general drinking. Simples. 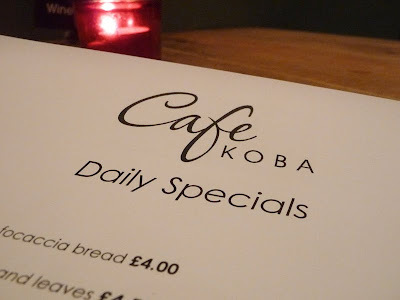 I was invited as a guest of Cafe Koba.